Make Your Players Class Donation Here! Add Player Name & Grade in Fall 2019 at Check Out! Only a handful of tickets left if you are interested in purchasing please contact us! Make a Tax Deductible Cash Donation to the Bothell Football Program! Questions about Donations & Tickets! Do all football families have to donate an item to the auction? We rely on all Bothell football families to contribute to the class gift $25 per player and to either procure, create or purchase an item for the auction. All families and players benefit from the funds raised and we need your participation to ensure that we have a successful fundraiser. Do I have to purchase a ticket or attend the auction? No, you don’t have to attend the auction but we hope that you will want too. This is our major fundraiser we encourage you to attend if you’d like to support the program and make some fun purchases. We also rely on our parent base to invite others to attend with you that are supporters of your son (like; grandparents, aunts & uncles) or supporters of the Bothell football program than enjoy an auction and contributing to fundraising activities. This a fun adult evening out not a place for young children. Can I attend the auction and not purchase a dinner ticket? Yes, if you’d like to be a helper. This is major event that takes lots of volunteers to run a successful night. We will have jobs all day and night that will need to be filled. All volunteers will receive a bid number too if they would like. How can I help, make a donation, or purchase advertising in the game day program? All contributions are welcome; we just ask that items are new. Think about what you’d buy at an auction and someone else probably would too. - Vacation Cabins or Timeshare Usage for a weekend or a week long stay. - Themed Gift Baskets - Click Here to view the list or search on the Internet for ideas. This is a great way to get family and friend involved in the auction! - Sporting Event Tickets - Seahawks, UW, Silvertips, T-birds, Mariner's, Aquasox's. -Local Attractions - Argosy's cruises, zoo passes, aquarium, museum's, etc. - Host a dinner or cocktail party for a group in your home or theirs. - Services - window cleaning, house cleaning, auto detailing, oil changes, car washes, hair cuts. - BE CREATIVE - Unique one of kind experience often sell the best. What kind of talent do you have that you can offer? What is the Auction for? 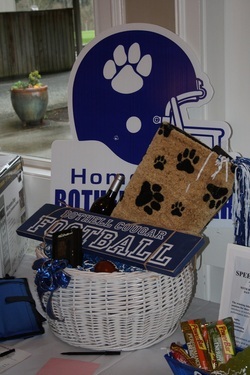 The Annual Bothell Booster Auction is the fundraiser hosted and organized by Cougar Football Club each spring to support Bothell Football, other athletic programs, and ASB at Bothell High. Where is the Auction? What day is the Auction? How much will the tickets be? How do I purchase? Ticket sales available now. $40 per person. Click the "Buy Now" button above or mail a check payable to: Cougar Football Club PO Box 42 Bothell, WA 98041. Deadline to purchase will be May 10 so we can provide an accurate catering count. What is included in the auction? The auction night includes; dinner, silent auction, live auction, raffles, a dessert auction, and gift certificates. What is the Dessert Auction? Each table will have a dessert bid card on it when you sit down for dinner. Each person/couple sitting at the table can put a dollar amount on the card with their bid number to purchase a dessert. When all bids are complete the card will be picked up by a player and totaled. Following the dinner the auctioneer will call out the table who bid the highest dollar amount to go pick out a dessert. Each table will be called in descending dollar order until all tables have a dessert. Once again the highest bidders could get the best dessert! This is an opportunity to raise money. The funds raised are considerable and are of great benefit to Cougar Football and other programs at BHS. The money raised help pay for; Camp Bothellhood, coaching stipends, team equipment, uniform needs, team transportation to camps, misc. team expense, team meals, game programs, merchandise, community banners, and much, much, more. The evening allows the parents, alumni, faculty and members of the community the opportunity to come together to celebrate the success of the program and cultivate relationships among each other. the other sports or activities involved. While the auction chair and committee do much of the basic planning and foundation work, it is the work of numerous parents that is essential in making this massive undertaking a success.